“It’s opener there, in the wide open air.” –Dr. Seuss, Oh, The Places You’ll Go. My nest is soon to be empty. Thing One left this past summer, got married, had baby, LEFT. Thing Two is moving out of state in a few months, having just turned 18. I get the feeling she isn’t coming back for more than a visit. She’s the independent sort, kinda like me. The Nest is very big. 4 bedrooms, 3 baths, 2 dens. In scientific terms, it is GINORMOUS. It isn’t horribly full of stuff, thank goodness. Still, downsizing is going to require some black-belt minimizing. This probably ought to scare me, but I can’t wait to be free of THINGS. I decided to start at the front door and work my way clockwise. 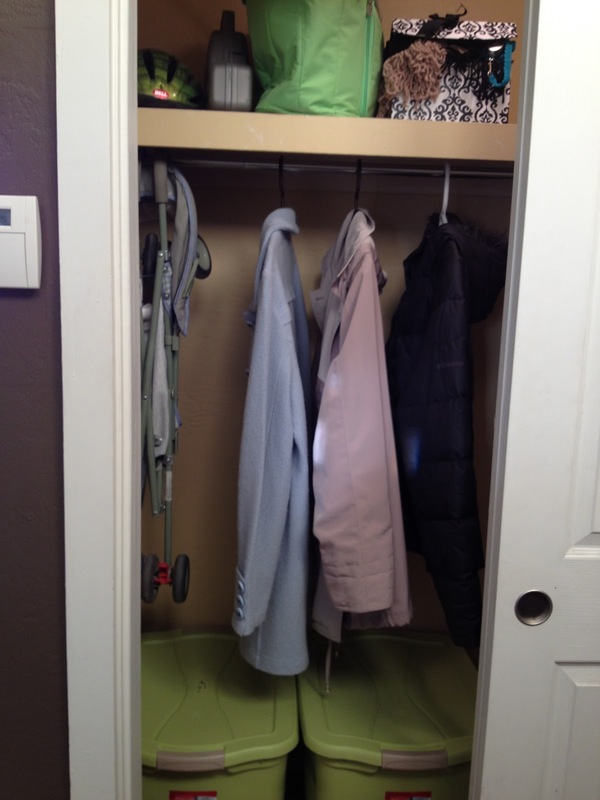 Step 1: the Nest’s coat closet–a cavernous space that not only holds coats and winter gear from the last 5 years of growth and fashion mistakes, plus all the luggage, but also holds all the lovely camping equipment that I bought with the best of intentions and have yet to use. I do camp, but oddly not in the past two years that I have owned the stuff. The call went out–take it or lose it. A few coats were claimed by Thing One and Thing Two. The rest abandoned, like the Nest. The coats were easy. If I didn’t love it and use it, it went into the donation bag. The luggage, which I bought with the Wasband more than ten years ago, is now outdated due to new airline baggage restrictions. It all goes. I have 3 sleeping bags. Doubt creeps in…what if someone needs to borrow one? What if I have a visitor and we want to go camping? What if I get really cold one night? (which, since my own bag is rated for -20, is a little silly). What if the Zombie Apocalypse comes and I’m not prepared?? I take a deep breath. I shove Worst-Case-Scenario-Mom back into her cage and lock her in. I remind myself that REI rents everything. (And also, since I can’t do parkour or even run a mile, I won’t make it past the first week of the Zombie Apocalypse anyway.) Then I think…if REI rents everything, then do I need to keep ANY of the brand-spanking new camping gear that I purchased? I could waltz into REI and rent the whole pile of stuff anytime I like, then give it back and never have to store it! Why store anything? Why own anything? Why not sleep on a mat and eat rice? Reason intrudes, thankfully. I think the minimalist urge can be a compulsion, and I make it a practice never to give in to compulsions if I can help it. So, I’m keeping one of everything I need to go camping, including my smallish family tent. I’m not a backpacker, so the weight of the tent doesn’t matter, and it’ll be nice if I go camping with a friend. I promise myself that if I do not camp in the next 12 months, I will relinquish it all and denounce the “I am a camper” self-delusion. Now the camping gear-for-one is put neatly away in 2 smallish easily-lifted bins that can be loaded into my car for spontaneous escapes. The coats are down to 3: fall, winter & rain. (I rethink “rain” because I live in the desert, toss it, then retrieve it because it packs well for travel.) 1 good pair of gloves. 2 warm scarves (1 colorful, 1 neutral). Snow boots. 1 (formerly 2) telescoping fishing pole. My bike helmet (the bike is also on 12 month probation) and my picnic basket for concerts in the park. The cavern is nearly empty. Previous PostI am lucky.Next PostI’m so excited! The first book of my new series!